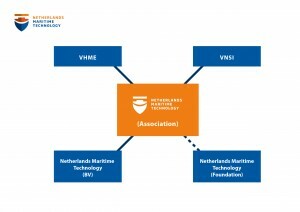 Netherlands Maritime Technology has different entities: the association, the foundation, and the BV (Ltd). There is a particular focus on issues linked to Trade, Innovation and Human Capital. The Association stimulates the development of technical innovations and clustering of know-how, and strengthens the presence of the membership in foreign markets. Member companies are active in the fields of maritime engineering & contracting, fabrication of installations and components, the supply of maritime services and ship repair. The Foundation’s goal is to realise national and European projects in the field of process innovation. The BV (Ltd) aims to realise projects in the field of export, innovation and training.